Currently owned by a European family, the Swan Lake Suite famously owned by the late Diana, Princess of Wales is available for sale. Beautiful, wish I could get my mitts on it. The price is stratopheric though, and only so because Di wore it & designed it actually as well. Which European family owns the pieces/suite? Her brother? 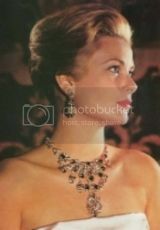 ^ This gives the entire provenance for the Swan Lake suite of jewels, which in fact Diana never owned. There have been several owners since then. Obviously the Ukranian couple who own the suite didn't get the price they wanted last year. ^Thanks. Got it. So, she only wore the necklace but never lived long enough to purchase the entire suite. How sad. The price is way overblown though. That the suite will go for quite a bit more than it's really worth because of the Diana link is to be expected, but for 12 mil you could have a whole suite (ring, bracelet, necklace, tiara, brooch, watch) made from scratch. They really have to drop a few mil if they want to sell it. The price as is now is way too ridiculous.